Let me introduce you to the best sangweech, (sandwich), ever created. This sangweech was originally created by my ex boyfriend. He happens to be best friends with my brother-in-law, and no it's not awkward at all. He gave the recipe to my sister, who adapted it to her tastes. She, of course, gave it to me. I then adapted it to my tastes. Let's just say, some like it hot and some like it too hot. I'm not the latter. I like my sangweech to have a little kick, not a whole beat down. So here is the instructions... 'cause building a sangweech is science, I tell ya. Ciabatta Breads, 6 inch size or cut one giant ciabatta in half. Cut the ciabatta in half so your sangweech has two sides. Set aside. Grab a pan and using the peppers in oil, cook the chicken for a minute or two. Take the chill off it. Add all the other ingredients and mix well. Heat it and bind the mixture together. 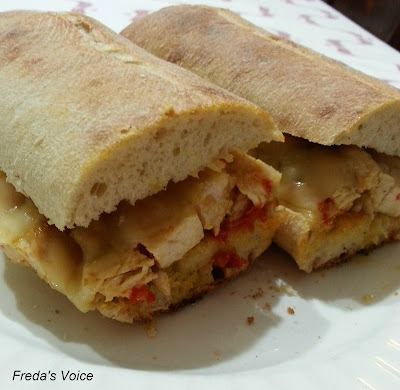 Add the chicken mixture to the ciabatta bread. Top with the cheese and melt in the oven. When it's melted, remove, add top of ciabatta to sangweech, cut, yes again, and serve. **This recipe is one serving. When making more than one sangweech, double or triple accordingly. **No compensation was received for posting. Opinions, photos and recipe are owned by this site. Quite the story, and a lot of pepper and heat!! My hubby would love it. I can't handle TOO much heat, but this does look good. I think my dad would love it, to be honest. Sounds like it has a little kick! Interesting provenance to the recipe. I think this sounds pretty good. Thanks for sharing it.